It’s never too early to start thinking about Christmas. An amazing, local volunteer opportunity for all ETSU students, faculty and staff is coming up soon. On Oct. 1, the Salvation Army of Johnson City will begin registration for the Angel Tree program for residents of Washington and Unicoi counties. Kylee Kilbourne, Donor Relations and Records Manager for the Johnson City Salvation Army, encourages all campus organizations to consider participating in the Angel Tree program. “I wanted to reach out and offer a volunteering opportunity to the students, faculty and staff of ETSU,” Kilbourne says. There are two shifts on each volunteer day. The first shift is from 9 a.m. to noon, and the second shift is from 1 to 3 p.m.
Those who volunteer will help families register for the Angel Tree program. In order to register for the program, one must provide photo ID, proof of children’s ages, proof of income, proof of expenses, proof of address and SNAP if applicable. This program is designed to provided Christmas gifts of new toys and clothes to hundreds of children under the age of 12 from low-income families in our local community. “Without the Angel Tree program, many children in our area would go without Christmas presents,” Kilbourne says. For those who have volunteered in the past, the location has changed. It is no longer located at the Gray Fairgrounds. Instead, registration is located at the Salvation Army’s Johnson City office on 204 W. Walnut St. In addition to volunteering, there is also an opportunity for individuals to adopt an angel from the Angel Tree. “We will be having Angel Tree adoptions at the Johnson City Mall from Nov. 15 until Dec. 7, with shifts from 10 a.m. until 9 p.m.,” Kilbourne says. Anyone who is interested in volunteering should contact Kilbourne as soon as possible to receive their desired shift. 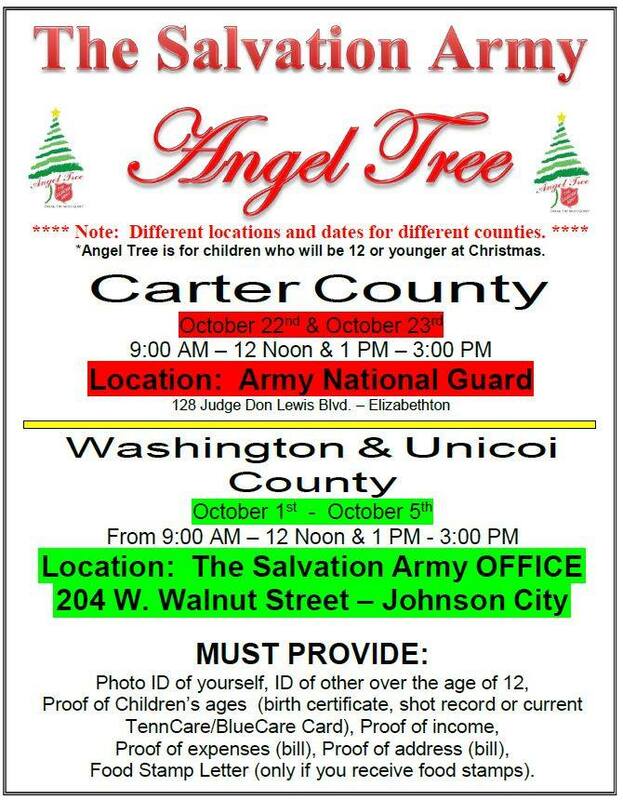 In addition to Washington and Unicoi Counties, the Angel Tree registration will also be available in Carter County at the Army National Guard at 128 Judge Don Lewis Blvd. in Elizabethton from Oct. 22-23. For more information, contact Kylee Kilbourne at Kylee.Kilbourne@uss.salvationarmy.org.